just to give some more informations on the module. It will be probably a 24hp module, brushed steel panel. -Direct interface between your device and your modular. No PC's. 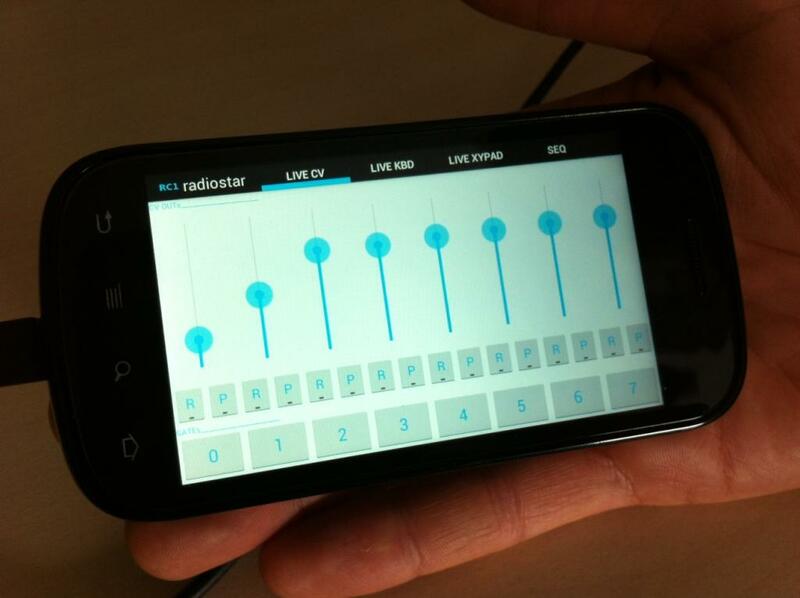 -LIVE MODE and SEQ MODE distributed among the various outputs. (SEQ mode is synchable to other modular equipment for tight timing). -It will support OSC over BT (either SPP and Low Energy application profile, to have on board either Android (or WIN, or what else...) and iOS). -It will have an expansion connector, to connect other 'medium' in the future. And finally, this is the initial UI design of the app (for now we are testing it on a NEXUS phone, but it will support ANY Android 4.0 tablet or handset. iOS app is also under construction. Some quick notes on the functionalities.The screenshot relates just to the LIVE features, there is a whole another world related to the SEQUENCER features, that could be mixed between the 16CV's and 8 GATEs). YES, press the R button and the movements will be recorded until you press the P button, when the RC1 starts looping the CV until you stop it. -Have a look at the tabs on the top of the screen. We have (among many others) the possibility to pop up a chromatic keyboard with pitchbend and mod wheels (a fuc*ing tiny cv keyboard, maybe also polyophonic, that is ) OR an X-Y pad with GATE signal related to z-axis accelerometer 'bumps'. -The app will comprise lot of things but NOT everything. We will disclose the protocol and the OSC address space to have others write apps and augment the object that could relate to your modular. Hi to everyone, we were very busy in many other projects (spesonline.com acts in a lot of markets!!!) but we have some juicy advancements here. Other than that we made lots of improvements in the Android base app and we started porting it to iOS. I think that it will be LOTS of fun. We also defined two expansions, one MIDI input and one Ethernet input (OSC). The product will be field-upgradable with a microSD card. Hope this is a good update! The website is on line! There are some new exciting modules and some descriptions! Please come to have a look and leave your comments. The site is not yet fully operational (no shop yet!) and under construction! We did not succeed in designing a single PCB (we thought of putting jack AND connectors on the same footprint but nope...) for the two versions. At this point, when the RC1 is up to work (I should receive protos by the end of this week!) I will call for interest in the 5U version and manage a run of "wired" panels. The +-15V power supply rails are not a problem! This is going to be epic. You should think about a standalone version! People would lap this up! position sensing keys would be sweet. Like animoog but bigger. Also, the RC1 is under completion, we are coding the 'startup' application for iPad (the Android one is OK) and we are writing the 16 tracks sequencer core!!! When the first step is done we will release and sell the product, then you can upgrade it with a microSD card! check back on our website soon!!!! Hi, i cant believe i have missed your modules, very interesting to say the least. 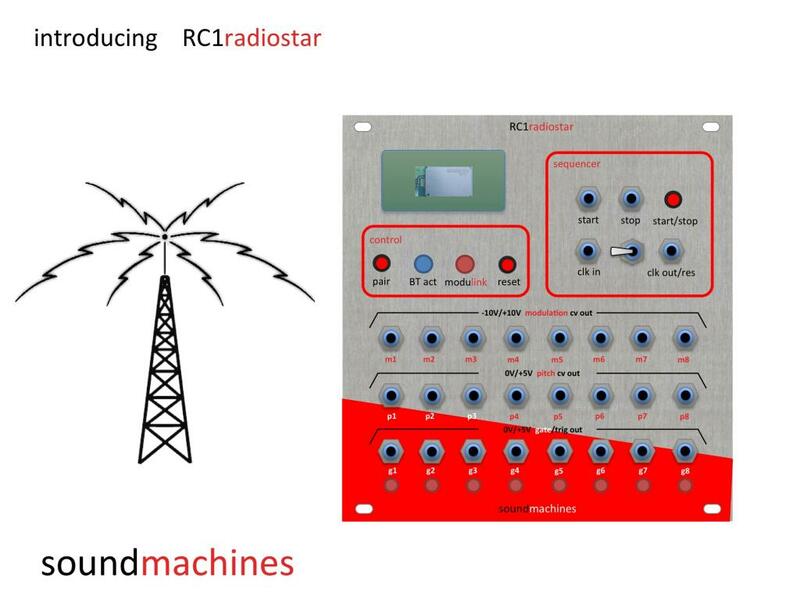 Can the radio star produce chords? I mean 3 oscillators getting different tunings? Could the sequencer do this? Please have a look at this videos! also, some other posts on muff!!! Hey, I'm wondering if you have tested the radiostar on a kindle fire hd, that's if it would even work on it, it is an android device but I don't think it's quite the same as normal android o.s. I'll volunteer my device for testing purposes if you can't get hold of one, if it's something you ever intend to test the rc1 with that is. Is this out? I see it being offered on ebay by at least one dealer but the homepage still says not released. YEAH! bot the product and the iOS app are available! We have to update the site's pages!!!!!!!! IOS only right now? When will other platforms be ready? Where can i find it on the app store? Tue app is named RC1, just search this or soundmachines.